Read no further than this. Guys. Just watch this. I ASSURE YOU anything you are watching right now is COMPLETELY a waste of time. (Except maybe a few top rated anime's on here). But seriously man. Enough reading this already. Just go to episode 1 already and click watch. You'll look up from you're screen in a few episodes and silently thank me later on. I guarentee you, you will NOT regret it. Before watching this, I wasn't really into harem. I was into mainstream adventure animes such as Naruto. It's only because I didn't know this masterpiece existed! The first 2 seasons have divided arcs by the heroins, taking 2 or 3 episodes to conquer each heroin, with exception of the first episode. That is pretty fair considering that a season is only 1 cool (1 cool = 12 or 13 episodes = quarter of a year) Note that there is a huge time skip going from season 2 to season 3. Season 3 jumps right into the goddesses arc, and Keima has already conquered 14 girls. The goddesses arc is pretty focused on the main idea of awakening the goddesses, but even though they are being serious, it's still funny at the same time! Animes that have clear objectives are rarely funny. Plus, in other harems, no matter how many girls chase the main character, only 1 or 2 girls get to do stuff with the main character. But in The World God Only Knows, everyone gets at least a kiss! How fair is that? I'm so looking forward to season 4. If I don't hear anything within a year, I might even fly to Japan to protest! P.S. KANON-CHAN IS MY LOVE! This is such an amazing Anime, I'd recommend it to anyone. You'll root for so many different characters, laugh with them, cry with them.. and most definitely find someone to relate to. If a 4th season is released, it will be perfect, otherwise I'll never be happy with the ending. Deserves way more recognition than it has. This is, without any second thoughts, one of my favorite anime series of all time. The story is (as far as I'm concerned) original and engaging, the characters are really likable and entertaining, the animation and style are well done and pleasant to look at, the music is awesome and memorable (the original OP song in it's entirety, God Only Knows, and the Love theme are two of my favorite songs of all time, and if you knew me and what else I had in my music library, you'd know that's saying a lot), and the voice acting (sub) is superb and hilarious to listen to (this is one of the only subbed anime series that part of why I like it so much is the actual voice acting; Hiro Shimono as Keima is always a joy to my ears and Kanae Ito as Elsie never ceases to make me go "AWW!"). And now (as of the writing of this review) since the 3rd season began airing, I've been loving this series even more! The twist in the plot has suddenly made the story even more engaging and I can't wait to see what's next. So if you haven't seen this series yet and are on the fence about watching it, there's never been a better time to join in! The show is such a well done balance of hilarious comedy and touching drama, and things are now getting even better! So hurry up and start watching; you won't regret it! A harem anime that applies dating logic from games into real life... and works?!? This anime proves itself to be highly unique compared to the typical harem anime. Unlike the typical harem anime, this anime breaks the ice in dating other characters almost immediately (first episode) and executes it with such precision that even a full fledged ladies' man would be put to shame. This anime is a must watch for any die hard fan of anime. Otakus ftw! 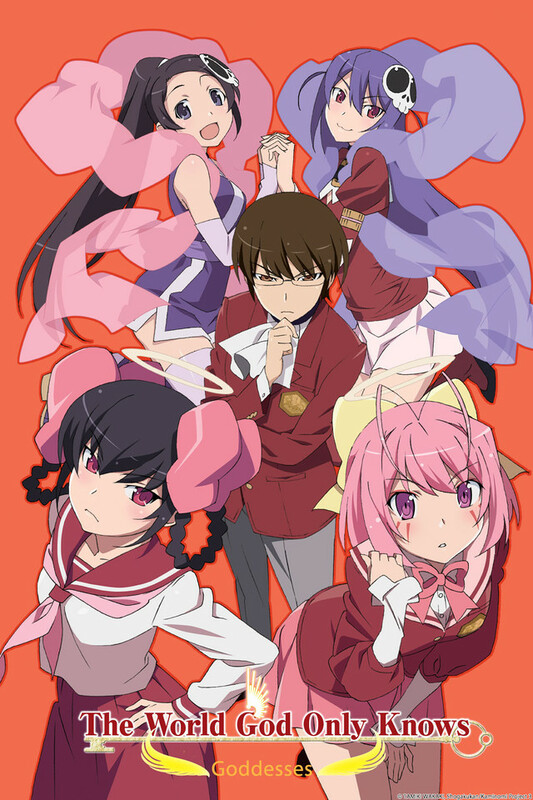 TWGOK starts off with our main character Keima Katsuragi- a 17-year-old boy living his normal life. He is a completely normal guy in every way except for one thing- he is a very good visual novel player that can easily capture the hearts of any female game character in any virtual dating game (also known as gal games) and is pretty much the God of (non-physical) Games- be it chess, shogi and battleships. So it should come as no surprise that he is known as the biggest loser in the world to his classmates and everyone else (except his mom). Anyways, one day, Keima receives an e-mail which asking if he- the God of Games- can really capture the heart of any girl (which he can. In games.) and proposes a challenge. Being awesome, he accepts and is suddenly hit by lightning. Divine intervention? No. A demon called Elsie de lute Ima lands on him and explains to the bewildered Keima that he has just signed a contract with hell that he has to help them re-capture malevolent spirits known as Weiss. These Weiss hide in the metaphorical holes that form in the hearts of girls and that's where Keima's role comes in- in order to get the Weiss out to capture it, one must fill that hole in the heart. And Keima's job description is that he has to fill up those holes with love. Yep,he has to capture a real girl using his gaming skills and if he fails he will literally lose his head. Needless to say, Keima was not amused. The story goes through with Keima's adventures as he has to find different ways to fill the hearts of many different types of girls including a librarian, and idol and a b*itch. I mean a tsundere. This sounds, understandably, like one of the stupidest plots in the world and is no different then other cheesy harems. You'd be wrong on that. The actual story is one of the most original I've seen. It incorporates many cliched elements found in harems and slice-of-life anime and masterfully makes it into something more original. This is helped by the fact that, throughout the series, there are only a few episodes of filler and even those fillers are hilarious. They make many pop culture references to the gal gaming world and, even though some explanations sound like nonsense, it is some of the best constructed nonsense I've heard. The story was enjoyable, lighthearted and easy to follow. It parodies many gaming stereotypes and presents them in an easy-to-understand way. The story does, however, have its moments where things slip up, though. And if it slips, it slips quite badly. I'm talking about season 3. While season 3 is not bad at all and adds much more elements such as actual and well thought out drama and gets more serious then the 2 previous light-hearted seasons, it does skip quite a big chunk of the story AND changes quite a few things. I don't mind this as I read the manga (and love it) but I'm pretty sure that people who don't will get very, very confused. It cuts out some really important stuff and while some of this is explained in the Tenri OVAs, it just isn't enough. If you want to watch the third season, I seriously suggest starting the manga or you won't enjoy it to the full (they also cut a really sad arc out. Actually glad they did). Moving on to the characters. This is what I really liked about TWGOK and the anime shines in this department. We have Keima- the man who strives for the ideal and detest real life. He may sound like an idiot but he is one of the best written characters I've seen. No Freudian excuse, no dark history and no traits that make him dis-likable. He isn't the idiotic, quirky character you would normally find in harems. He is a character who lives by his ideals. Despite this, he still gets development. Through the course of the show- especially in the 3rd season, you can see him change to become less "holed-up" in his own world. And, to top it off, he is voiced by Hiro Shimono- one of my favorite seiyuus. The other characters also need a good deal of mention. While most of them are anime tropes, they exhibit their own, unique air which just makes them likable. The girls whom which Keima has to seduce to get the Weiss out all have discernible traits that make them different from other similar anime characters. They have their own back-stories and it is interesting to see how Keima can get them to kiss him (getting the Weiss out). We, the audience, know that the methods (gal game methods) Keima uses will probably get us slapped if we attempted them in real life but it is still fun to watch. This makes it sound like a typical harem but the author managed to avoid this in quite a dastardly smart way- after a "capture" and the Weiss comes out and is caught, the girl has no memories of the dates etc. May sound too convenient but it actually sounds smart if you think about it. It is because of this that the show isn't technically a true harem and is very toned down- allowing the author to play around, and parody, with different settings. Elsie- the demon that helps our main chracter on his conquest- is likable even though she doesn't receive a lot of development in the anime (although she does have more development in the manga). The only real problem I have with the characters is that, because of the memory wipe thingy, the target girl only gets, at most, 4 episodes of screen time and though some do make re-appearances, it just isn't the same. That said, you'd still be able to find a favorite girl. Animation is smooth. It does change but that's only because of the predominant comedy genre (so you will see less of it in the more serious 3rd season). It isn't brilliant but it is done in such a way to make the anime more fun to watch- lots of bright, solid colors and no dark settings. The music is, while not top-notch, done well and each scene is well-set out and there are some points where you know the specific type of music being played is for the parodying effect. It tones down at the right times and also manages to get serious in the 3rd season. Very nicely done overall. The World God only Knows is one of the best harem romantic-comedy I've seen ( probably because it's not really a harem). It has a solid storyline which doesn't get repetitive due to different settings for each target girl. It also manages to not over-use this formula as the 3rd season paves way for more different approaches. This anime is really fun to watch and I'd recommend it for those who just want something light-hearted and cheesy-sounding. It has one thing many anime don't have- style. That alone makes it better then many other harems. If you've already watched this then I suggest reading the manga as well to get more info. The manga is better but the advantages of animation makes this something you can't miss. Just one look at that name- The World God only Knows- and you'll remember it. Funny, original and relatable. Don't miss it! At first glance The World God Only Knows premise put me off, to be honest. An anime with a fanatic dating-sim player as its’ hero didn’t seem very appealing to me. The thing is though, when I actually started watching I noticed immediately that the writer is very aware of this and uses it in a great way. The show has a main character who is out of touch with reality but the show itself feels like it’s very much in touch with reality. I think it’s because The World God Only Knows isn’t afraid to play around with all the story possibilities between these two extremes, that it really shines. I found The World God Only Knows at the same time both extremely imaginative and extremely relatable. Also it’s funny, really funny. That’s its’ strongest point, I think. The story is about a high-school boy, Keima, who’s a fanatical dating-sim videogame player. He accidentally signs a demonic agreement with a somewhat dimwitted, yet all the more cute, demon-girl, Elsie, to help her catch “loose souls”. These loose souls hide inside the emptiness of a girls’ heart. By conquering these girls he replaces the loose souls in their hearts with his own love, so to speak. This in turn chases the loose soul out, allowing Elsie to capture it. After a loose soul is out, the girl forgets everything that happened between her and Keima. So in short, Keima is forced to do in real life, what he usually only does in dating-sims. He has issue with this, because he normally avoids real-life as much as possible to be able to play his games as much as possible. The story felt really smart to me. Characters treat each somewhat like you’d expect them to in real life. Their reactions to the strange situations the story present them with have a kind of ‘real’ feeling to them. What’s funny for instance, is how Keima is very unpopular at school, just like you’d expect him being an extreme otaku and all. When Elsie first suggests that he should win real girl’s hearts, his immediate reaction is no can do. He only does this in games and wouldn’t know how to in real life, nor does he care. This kind of making fun of its’ own premises, is what makes The World God Only Knows feel so sharp and real, while being amazingly imaginative at the same time. When Keima actually starts winning real-world girls it may feel like a bit of stretch but not as much as you’d expect. This is because the personal problems Keima helps these girls overcome feel very realistic and recognizable. The same goes for how he helps the girls psychologically. These solutions don’t feel like too much of a stretch either. Maybe how fast he manages to become acquainted with the girls felt a bit unrealistic. But this is where a lot of the comedy of the show goes. Keima goes to funny extremes in his efforts to ‘clear’ the girls. These extremes explain to some extent how he manages so quickly. As I said, I thought this show was actually funny. I laughed aloud many times. To clarify, most anime don’t really make me laugh anymore. Just hearing “Shoubousha!” (firetruck) still makes me chuckle (watch, you’ll see). What’s also good is that the story is smart and stays consistent with itself. It stays interesting despite its’ returning premise of capturing a girls’ heart. One of the things that kept it fresh was how the girls always do unexpected things. Unexpected but not that unrealistic, you’ll feel afterwards. Just like in real life, Keima will have to adapt to these things and it’s fun to watch him do this. Fumbling, yet managing to reach the finish line in the end. Plus both Keima and the story end up having a lot of heart while expertly managing to just stay on the right side of the line of cheesiness. I found the characters mostly interesting and likeable. Although they don’t feel altogether original they manage to avoid the typical personality types. They’re combination of strengths and vulnerabilities made them feel close to real to me. I also like how the story doesn’t just let Keima focus on the problems of others but also makes Keima the subject of others’ worry. Of course it’s obvious to any viewer right from the beginning that Keima has some psychological issues. In most anime the main characters’ demons become the focus of the plot at some point but the way The World Only God Knows does it feels more natural, somehow. The story let’s Keima ignore his own problems for some time but at some point confronts him with himself more and more. If there’s anything negative I can say about the show, it’s this. The girls forgetting about everything, after being ‘conquered’ felt like a bit of a cop out. This is a very obvious plot element for the sake of letting Keima conquer several different girls. I can sympathize with the writer about this, because the story would get incredibly complicated if Keima would have had to deal with all the different girls at the same time. And all the other story elements are so expertly put together that I can’t help but forgive him for this. Plus lo and behold, in the third season, Goddesses, many of the girls are actually made to remember their events with Keima at the same time. To great comedic effect, I must add. That brings me to the last thing I feel I should discuss, The World God Only Knows’s third season, Godesseses. For Godesseses, they skipped a whole bunch of manga chapters and moved on to a new story arc (thanks, to commenters who pointed this out). In short, the fight between heaven and hell comes to the forefront and becomes the main subject of the adventures. The tone becomes more serious, with lots of conflict and intrigue. As I said, I like about Godesseses how Keima has to juggle multiple love-interests at the same time, this time around. That said however, the main story-line felt too much like that of a very typical shounen-anime to me. As such, I can’t really fathom why they skipped so much of the story-line. I liked the first two seasons a bit better than Godesseses. Still Godesseses is a lot of fun to watch as the series hasn’t lost all of its’ humor and relatability. In summary, The World God Only Knows is a great anime. It’s funny, original and relatable. You shouldn’t miss it! Best Harem Ever? Quite possibly. Honestly, I'm a bit more fond of the harem genre than I would like to admit. And a lot of that has to do with this show, "The World God Only Knows." Most harems have a self-insert protagonist that has a bunch of girls of various tropes fawn over him without any kind of real rationality behind it, even after he shoves off their advances over even multiple seasons. TWGOK takes that concept and annihilates it. It is a harem for sure and it knows it, but it sets itself up over that initial concept of harem anime and takes it on a very new direction. The plot sets itself up for the harem to be there for a very good reason. To put it simply, a cast of a variety of women all become possessed by these entities known as "lost souls" who enter their bodies and take shelter in whatever emotional piece of their heart is missing. Since for most people, the most fulfilling emotion we can have is love, it is forced upon Keima, after inadvertently signing a contract with a demon, to woo these women and fill their hearts with love and chase the lost souls out of them. Before this incident, Keima has kept all interaction with the real world to as much of a minimum as possible, taking refuge in his visual novel romances to find fulfillment. So he must only use the knowledge he has of conquering 2d women to win the hearts of all of these very real women. However, while the hosts of the lost souls inevitably forget their conquest, Keima does not, and it begins to take a very noticeable emotional toll on him. As for the cast itself, I must say that initially almost every character will appear extremely shallow. But that's the point, each character is a mold of a very well established trope, and through falling in love and growing as people, grow out of that trope to become a deeper character. There honestly isn't a single character in this entire show that I ended up dissatisfied with by the end of the 3rd season, which says a lot. The show progresses in a fairly, "character of the week" fashion for the first two seasons each providing minor developments to the world around them and the two main characters especially, Keima and Elsie. The third season picks up a lot of the drama however, and takes that same concept from a new angle, adding a lot more depth and consequence to the situation. And that's what I really like about this show. For as cute and funny as everything is (and it is very much both those things), it has a lot of really thick drama and plays it's supernatural elements with a very even hand. Honestly, this is one of the few shows that I rate as perfect. This show is an experience like no else, and if romance (especially harems) or comedies fit your bill, this show is undoubtedly going to provide them to you in spades while still leaving you feeling refreshed with a fulfilling experience by the end of it. This is a fantastic rendition of the closest thing to a perfect Harem. I promise, you will fall in love with most every character unless one of them has an attitude that strike a bad chord with you based on a past experience. It wasn't perfect, and didn't grab me completely at first, but after some time you find yourself adoring every last part of it. I can't quite pinpoint why. It was only above okay for me at first, and somewhere along the way, somehow, somewhy, it has made it into my Top 5 animes. The Strength of "The World God Only Knows" lies in the characters. Specifically the lead characters and how they are able to adapt to different roles each week mashing a "VN-Quantum leap" feel together. One could try to compare this show to "Haiyo nyaruko-san" in theory since both shows try to parody the cliches that exist in the harem genera, though where they differ is what makes TWGoKs a drastically better show. "Haiyo nyaruko-san" devolves into less of a parody and more of a strait harem throwing in the occasional gag here and there to try to hide this from the audience, where as TWGoK holds strong in its convictions driving a well balanced mixture of comedy and drama with excellent writing and characters. If you are on the fence about this show, go ahead and watch it.